Where Have All the Owls Gone? 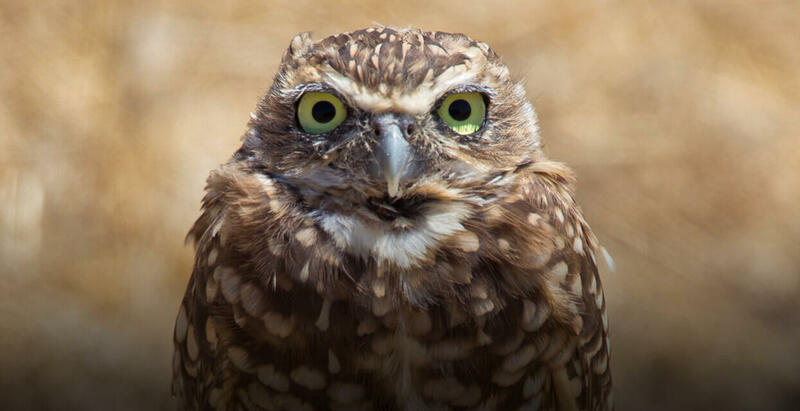 The western burrowing owl population in San Diego County is at risk of going locally extinct. As a result, our Recovery Ecology team is working with our partners to understand ways to halt and hopefully reverse the owls’ decline. We are studying their nesting success, predation and other causes of mortality, and food and habitat needs, all with the aim of helping land managers protect these diminutive and charismatic raptors. A major cause of the western burrowing owl population decline is the local extirpation of other burrowing animals, such as prairie dogs, badgers, and desert tortoises, which dig the burrows the owls use for nesting and shelter. In San Diego County, the primary burrow builder is the California ground squirrel. Since 2011, our team has been working to develop strategies for reestablishing ground squirrels in protected areas of the county. We have tested and measured the use of translocation to bring squirrels into areas where they have been removed, and modified habitats to encourage natural dispersal in areas that still have remnant populations of squirrels. The burrowing owl is a grassland specialist and requires short open grassland to thrive, but unfortunately intact native grassland is rare in our region. We have been visiting many grassland habitats throughout the county to search for the presence of both squirrels and owls. We are measuring vegetation and soil conditions in order to characterize the areas that support these two species. We are also using this information to prioritize areas for habitat restoration and translocation. In many parts of the burrowing owls’ range, including San Diego, artificial burrows are used in place of naturally dug burrows. However, unlike natural burrow systems in active squirrel colonies, artificial burrows are not self-sustaining and require costly upkeep and maintenance. To build a better artificial burrow, we measured temperature and humidity inside both natural and artificial burrows, and compared them relative to the birds’ reproductive success in each kind of burrow. Since the results showed that natural burrows are better for reproduction, we developed an updated design for artificial burrows that better mimics the temperature and humidity levels of natural burrows. We are currently implementing this new design. Unfortunately, burrowing owls have been affected by the increasing development occurring in their habitat. Current mitigation strategies for burrowing owls slated to be impacted by development in California rely largely on “passive relocation,” in which owls are excluded from their burrows and have their burrows crushed, with the hope that the owls will re-settle at nearby natural or artificial burrows (if they are present). However, it is not known how well this strategy works or whether other mitigation strategies might improve relocation outcomes. To evaluate and develop more effective long-term mitigation strategies, we are conducting the first large-scale study of owl fates after translocation using two different methods. In method 1, owls will be relocated following current passive relocation guidelines. In method 2, “active relocation” will be used, where owls are captured and moved to protected areas set aside for wildlife and landscape conservation. Across southern California, we are tracking owls using satellite GPS telemetry to learn about their movement patterns, survival, and reproductive success after translocation. We are also testing new strategies to help improve settlement by adding species-specific acoustic and visual cues that will indicate to relocated owls that other burrowing owls are already present. In combination, this research will help managers develop new, more effective mitigation methods to help conserve burrowing owls.